Snuff was my first Terry Pratchett book, and thus my introduction to the Discworld series which I had heard a lot about before. 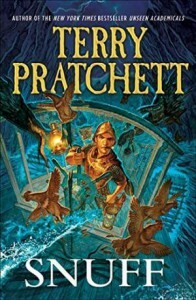 At first, I enjoyed Pratchett's eloquent writing and was happy that I didn't seem to need any prior knowledge about the characters in the book. After a while though, the story failed to interest me and the second half of the book was a struggle to get through. Many new characters were added at a fast rate, and I had the feeling that I was supposed to know these characters (mainly Vimes' colleagues from the Ankh-Morpork city watch) and their history with commands Vimes. I honestly skipped most of the last pages. The story just wouldn't end! I don't think it's too bad a book, but I guess I should have started with an earlier issue of the Discworld series instead of this last one. Too bad!